Seaquest is yet another stellar arcade-style game from the folks at Activision. The game successfully combines elements of Defender and Choplifter and tosses it into the ocean. You pilot a submarine that rescues divers while fighting off huge fish, man-eating sharks, and enemy submarines. You have a limited supply of oxygen and a maximum capacity of 6 divers. Once you have 6 divers on board, surfacing your sub refills your oxygen tanks and gives you a points bonus for each diver. If you surface with less than 6 divers, your tanks still refill but you’re docked one diver and the level continues. Surface without any divers and for whatever reason, you die. As the game progresses, the difficulty increases through the presence of more foes. As is the case with all of these old games, the premise is simple, but if properly executed provides a fun and lasting game experience. 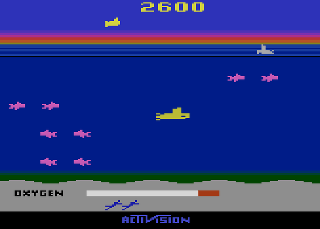 Yet again, Seaquest demonstrates Activision’s abilities to create games that were head and shoulders above what Atari was creating for it’s own console. The graphics are colorful and eye-popping, although the proportions are interesting, and the sound effects are bright and engaging. I would easily list this game among the best available for the VCS. Buy Seaquest on GameGavel or Amazon. Tagged 2600, Activision, Arcade, Atari, Review, Seaquest, Shooter, VCS. Bookmark the permalink.